One thing Pam Hampton's students know about her is that she makes everything fun. 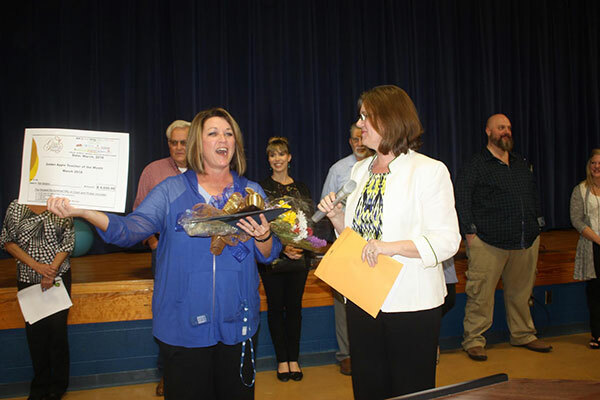 Hampton's lively spirit is just one reason the veteran educator was named the Golden Apple Award Teacher for March. 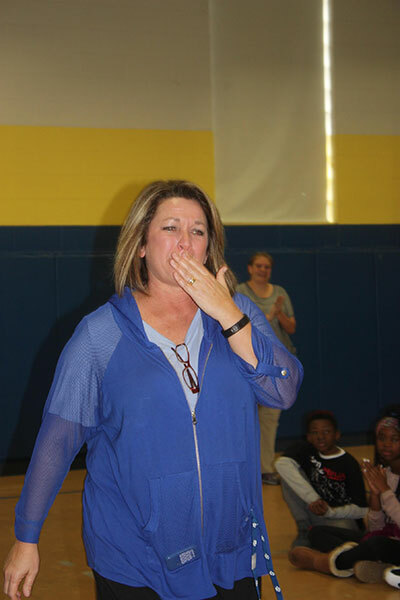 Hampton, who teaches physical education at Quitman Upper Elementary School, said when she started her journey 21 years ago, she never thought it would be so rewarding. "I knew I was doing something I wanted to do," she said. "I never thought teaching P.E. to elementary kids would be this rewarding, and to receive the Golden Apple – that's the ultimate." Leah Ivey, the school's principal, said Hampton exemplifies dedication to her students by expertly weaving physical education, health, reading, math, and science standards in with life skills in a friendly, competitive atmosphere. "The walls of her gym are covered with motivational sayings and quotes like, "Winners never quit; quitters never win," Ivey said. "As students learn new games, participate in activities, and do exercises, Mrs. Hampton uses these quotes to encourage them not to give up." Hampton, who was a basketball player at Sebastopol High School, earned a scholarship to East Central Community College and Mississippi State University – where she majored in teaching and coaching. At MSU, she met her husband, Steve, who was also in the teaching and coaching program. But her love for sports began at an early age. "I had a sixth grade teacher who every time we did something good he would reward us by letting us go to the gym," Hampton recalled. "Then, after I got to college my coach asked me if I could do anything I wanted to do, not get paid, and have fun doing it. What would it be? I said, "I think I want to coach." Shea Goff, the public relations director with the Quitman School District, said nominating Hampton for the award was an honor. 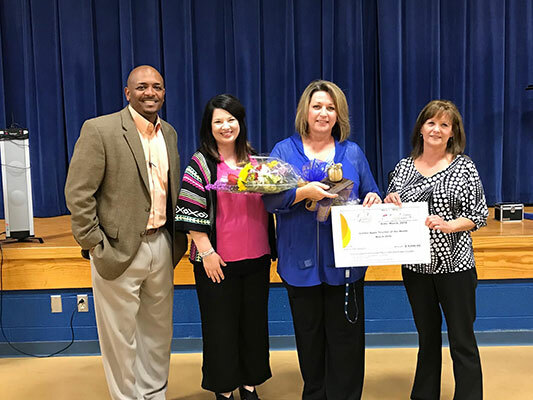 "My job gives me a unique perspective on what our teachers do, and for almost five years I have been walking into classrooms throughout the Quitman district – time and again my job has taken me into Mrs. Hampton's gym," Goff said. "Her students are excited, engaged, and eager to listen. But, of course, they are, it's P.E. "They get to run around and play. Yet Pam integrates multiplication, vocabulary, anatomy, lessons on kindness, and so much more into the complex games she has the children play. It's truly remarkable to watch, and you can't help but walk away understanding that you've been in the presence of a teacher and what an honor that is." 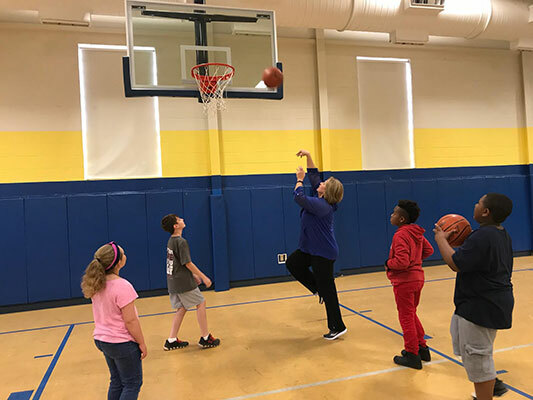 Quitman Upper Elementary physical education teacher Pam Hampton works on some basketball skills with students Eliza Harris, Austin Fagan and Brenton McKenzie. 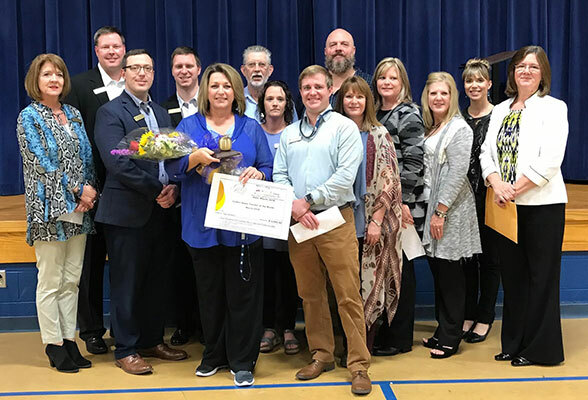 Hampton was named the Golden Apple winner for March during a recent ceremony. Hampton's philosophy of teaching is simple – it's all about having fun. "If the kids are not having fun, and I am not having fun, then it's not going to be fun," Hampton said. "If they are having fun they will do better in class. I do think my strong point is classroom management because I can manage a lot of kids at one time, which allows me to incorporate academics into physical education. "I try to have fun, and sometimes I may be overboard crazy, but I think having fun is contagious." Hampton's attitude gets high marks from her young students, such as fourth grader Eliza Harris. "When I see the Golden Apple Award on TV, I always look and hope to see my teacher on there," Eliza said. "I think it is amazing that she won because she is one of the best teachers we have." Ivey said not only does Hampton guide students to be their best, she does the same thing with her colleagues. When something needs to be done, she volunteers or accepts her assignment with a smile. Her humor and light-hearted dialogue demonstrate her love for life. 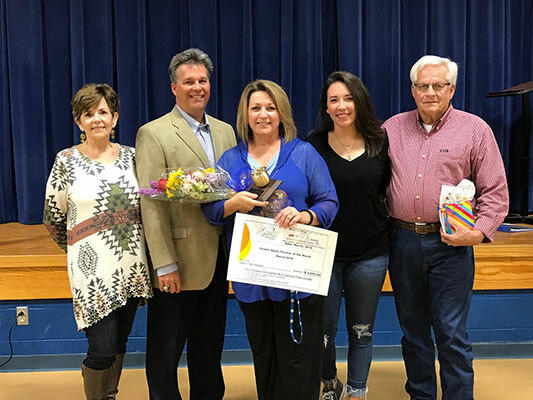 "She is highly respected, deeply appreciated, and certainly recognized as an outstanding educator who has and continues to positively impact the lives of students, parents, and coworkers," Ivey said. "She exhibits a sense of pride in her school, students, district, and community."